Our Traveling Banner has been very busy traveling. 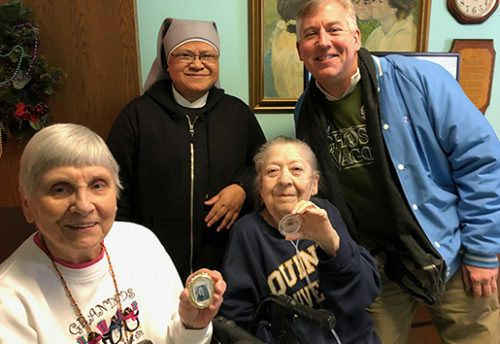 Today three Little Sisters and an Association member took it to visit the cemeteries where our Little Sisters from Minneapolis and St. Paul are buried. It was a cloudy and cool typical fall day. Our first stop was at the Resurrection Cemetery, which is the one we are using now. There are eight Little Sisters buried there. When we arrived there was hardly anybody to be seen. 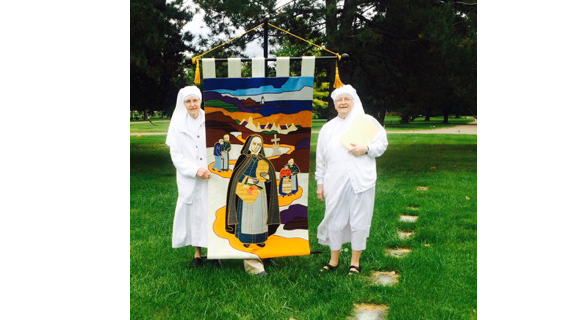 We introduced the banner to our deceased Little Sisters and let them know the reason for our visit. We prayed the novena prayer and a Hail Mary for vocations, after which we said goodbye and we continued on our way. Our next stop was at St. Marys’ cemetery in Minneapolis, where we had to look for the plot as there was no one in the office. After going round and round searching through headstones we finally found it. There are eighteen Little Sisters there. 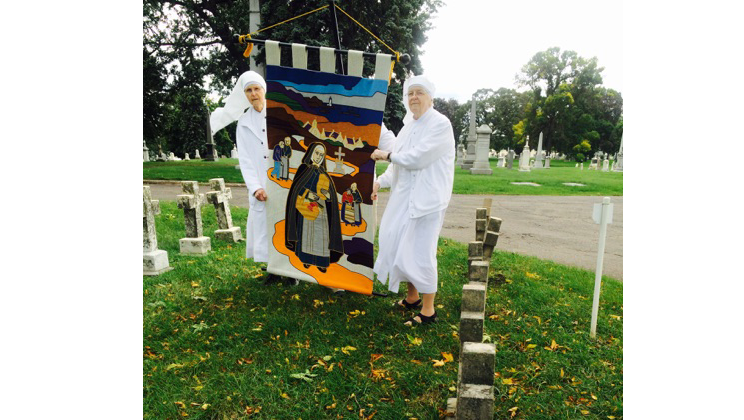 We of course introduced the banner to our deceased Little Sisters and prayed our novena prayer, this time for the intentions of the Council of the Congregation, and added a Hail Mary for vocations. Then we continued on with our pilgrimage. We went back to St. Paul hoping to beahead of the traffic, since it was the peak hour on Friday afternoon. This time we started seeing the black clouds moving away and blue sky coming through. Calvary is one of the oldest cemeteries in the city. We were happy to see a couple of workmen men there who helped us locate our lot. 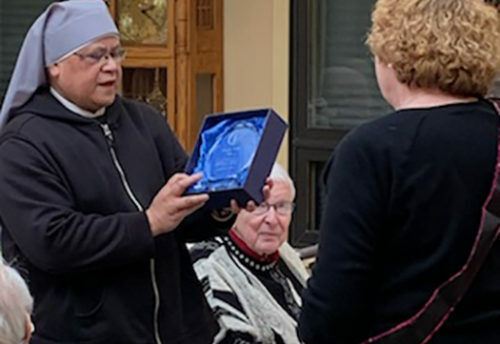 We did remember that the Little Sisters are not far away from the bishops and other religious of different congregation. When we arrived there we went straight to visit the tombs of the three bishops. 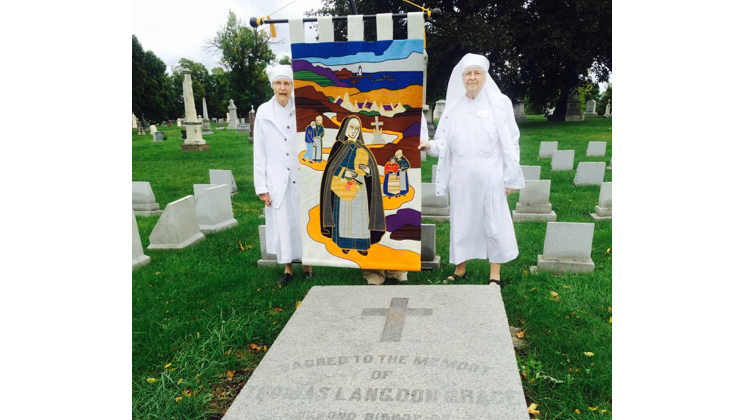 The first was Bishop Grace, who invited the Little Sisters to St Paul, with Bishop Ireland next to him. 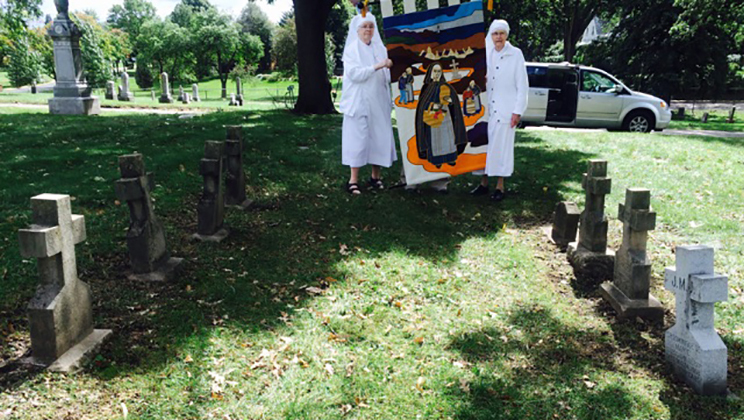 We prayed at their tombs for our Church and again introduced the banner. We prayed our novena prayer and Hail Mary. The Little Sisters graves are not far from there. 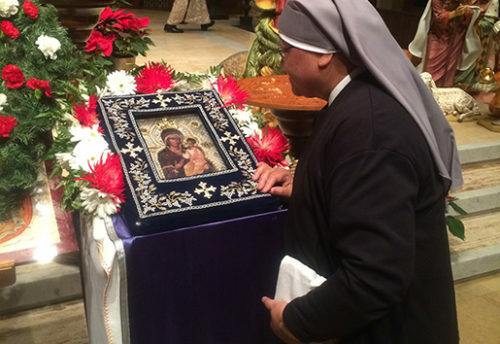 We introduced the banner to the Little Sisters and of course we prayed the novena prayer and a Hail Mary for vocations. There are 26 Little Sisters buried there and as well as another section for the “inmates”of the Little Sisters of the Poor. By the end of our travels the sun was shining and sky was blue and it was a real fall day with the leaves starting to turn.